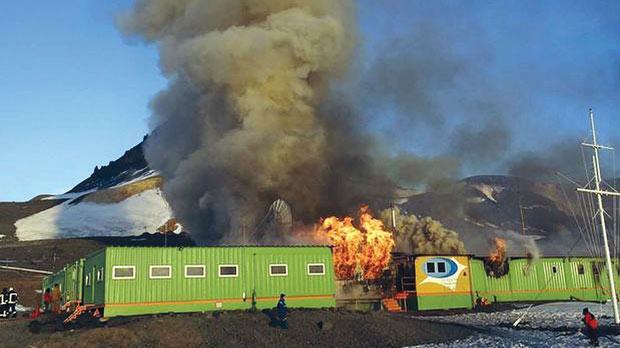 The Brazilian Antarctica’s base Capitao Ferraz burning on Saturday. The destruction of Brazil’s Antarctic base in a fire that killed two navy personnel has dealt a major blow to the country’s strategic research on the resource-rich continent, experts say. “All the central core of the base, where the installations were concentrated, was lost. The exact extent of what occurred still needs to be determined, but the assessment is that we really lost virtually everything,” Defence Minister Celso Amorim said late Saturday. As the government weighs the extensive damage, a Brazilian Air Force C-130 Hercules aircraft picked up 44 evacuees from the base – 32 civilians and 12 navy personnel – in Chile to fly them back to Brazil, officials said. Brazilian experts meanwhile were assessing the implications of the damage after Saturday’s blaze, which swept through a room housing energy generators of Brazil’s Comandante Ferraz research base located in Admiralty Bay, King George Island, near the tip of the Antarctic Peninsula. The base, which was established in 1984, conducts biological science research focused on coastal and shelf marine ecosystems. The Ministry of Science, Technology and Innovation said on its website that scientists at the base were conducting studies on the effects of climate change in Antarctica and their impact on the planet, in addition to research on marine life and the atmosphere. “It’s an irreparable loss,” the daily O Estado de Sao Paulo quoted Yocie Valentin, a Brazilian expert in charge of scientific work in Antarctica, as saying yesterday. “We are doing cutting-edge science in Antarctica, studies with important implications for climate in Brazil, fishing resources and biodiversity,” biologist Lucia Siqueira Campos, a member of the National Committee of Antarctic Research, was quoted yesterday. The icy continent plays a crucial role in regulating climate and oceanic circulation in South America. In addition to the loss of very expensive equipment and all data collected since December, the fire leaves dozens of Brazilian study groups without a fixed base in the area.President Dilma Rousseff vowed that the Comandante Ferra base would be rebuilt and Mr Amorim said plans for the reconstruction would begin today. Killed in the accident were non-commissioned officer Carlos Alberto Vieira Figueiredo and sergeant Roberto Lopes dos Santos. “In an act of heroism, they were in the area of major risk in a bid to extinguish a fire and they did not succeed,” Mr Amorim said Saturday.